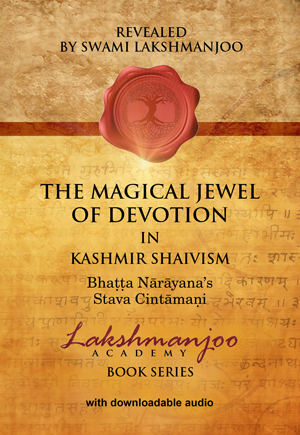 Shiva Sutras: The Supreme Awakening This spiritual treasure, gifted by God to the sage Vasagupta for the upliftment of human kind, is considered to be one of Kashmir Shaivism’s most important scriptures. The Shiva Sutras are divided into three parts. 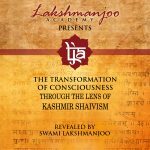 And according to Kshemaraja, the commentator, the three parts correspond to the three means (upayas) for the attainment of liberation as revealed by Kashmir Shaivism. These upayas are the means for traveling from individual limited consciousness to universal God consciousness. The first and highest means, for highly qualified aspirants, is called shambavopaya. The second, for aspirants of medium qualifications, is called shaktopaya. And the third, for inferior aspirants, is called anavopaya. Thus, the first awakening of the Shiva Sutras explains shambhavopaya; the second awakening explains shaktopaya, and the third awakening explains anavopaya. Drawing from the Malinivijaya Tantra Abhinavagupta defines shambhavopaya as the upaya wherein the aspirant achieves entry into supreme consciousness just by the grace of his master, without adopting any process. He does not use thought (dhyana), mantra, or any other aid to meditation. Shaktopaya he defines as the upaya where the aspirant achieves mystical entry (samavesha) through contemplation of that mental object which cannot be spoken or recited. Anavopaya he defines as the upaya where mystical entry takes place through concentration on parts of the body, contemplation (dhyana), recitation, taking the support of breath (uccara), and mantras. The means of traveling from limited consciousness to universal consciousness depends on the ability of the aspirant. Abhinavagupta tells us that the aspirant should always try for the highest and best thing first. Thus, in his Tantraloka, he has defined and elaborated the highest upaya, shambavopaya, first. 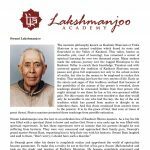 His descriptions of shaktopaya and anavopaya follow. And so it is that the Shiva Sutras also start with the highest and most refined means. Order the Shiva Sutras: The Supreme Awakening study set from our website.